Mahindra has launched a limited/special edition variant of its Scorpio SUV christened as Scorpio Adventure. It is based on the top end Scorpio S10 variant and is available in both 2WD and 4WD. Price of the Scorpio Adventure 2WD is Rs. 13.07 lakh ex-showroom Mumbai and the 4WD variants costs a lakh more. 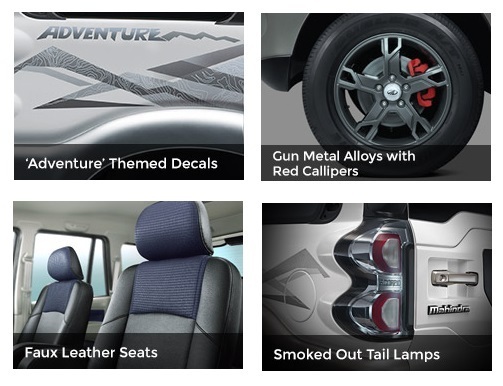 The Scorpio Adventure gets two tone exterior colour scheme, Adventure themed decals, gun metal grey alloy wheels with red brake callipers and smoked tail lamps. In the interior there is faux leather seats with blue fabric inserts plus faux leather wrapping for steering wheel and gear lever. Only 1000 units are for sale and it is an ultimate attempt from Mahindra to keep the aging Scorpio alive.